Last week a Chinese computer company sell a laptop with $45. There is some english information about the laptop. 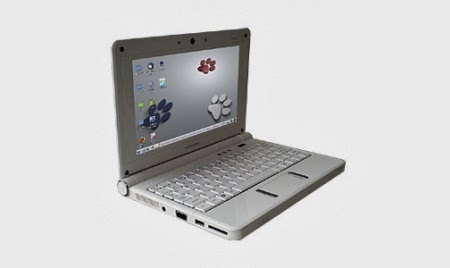 Lemote ultra mini-laptop is powered by the latest design-by-China 64-bit Loongson-2F processor which speeds at 900MHz.The integrated DDR 2 and PCI 2 controllers and independently designed Northbridge chipsets. It employs the latest Loongson-2F processor, 64-bit, four-issue Out-Of-Order structure and integrated memory controller. Less than 20 W, which is one tenth of an ordinary PC. The materials are ROHS compliant. Yeeloong 8089 is a safe computing device. On one hand, the hardware components including chipset and matching motherboard are designed by Lemote wholly, which lowers the risico's being intruded by various viruses. On another hand, by employing GNU Linux operating system, it is almost immune to viruses. The unique programmable Northbridge provides space for customization; the operation and application of free operating system could adopt a free open-source software (FOSS), which is a powerful software package management mechanism that provides the most convenient methods for users' customization and development demands to exempt from getting into the trouble of software copyright. The entire product, including processor, system, software and so on, are all designed by Lemote. The cost for software, hardware and synthesized usage cost is only of an ordinary PC. Interface: USB2.0x3, earphone+MIC, SDx1, RJ45x1, VGAx1, DC-inx1; SD reader supports SDHC. USB: 2 x USBBattery: 3 Cell Lithium. It could be used as ordinary laptop as well as professional computing device for users who have higher demand for security and software customization such as institutions, prototype product development, government, corporate R & D, high education, financial and security organizations etc.